Want to save 10% on your car insurance? At Youi we're always doing something new and we want you to be a part of it. T&Cs apply and are available here. 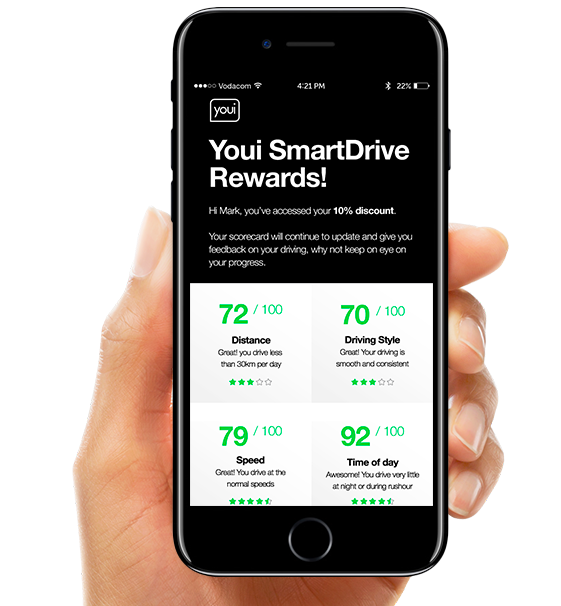 SmartDrive is a new bit of tech within the Youi app. Once you opt in and turn it on, it analyses your driving behaviour and gives you feedback. And hey, we’ll give you 10% off your car insurance for simply reaching your first scorecard. Make sure you have the latest version of the Youi App. How to unlock your 10% discount. Open your Youi app and go to ‘more’. Tap on the SmartDrive menu item & follow the prompts to activate. You can track your progress towards your 10% discount in app. Discount is calculated on the remainder of your car insurance premium(s) for your current policy period and will not apply to a renewal period. Full terms and conditions are available here. This gives a great sense of how much driving you do. The less you drive, the less chance there is for you to be involved in an accident. Improve your distance score by not driving if you can avoid it, by car-pooling and by using alternative methods of transport. Your driving style is determined by how smoothly you accelerate, brake and corner. Smooth driving is generally associated with people who are alert while on the road and aware of the cars around them and who keep a safe following distance. Improve your smoothness score by avoiding distractions while you're behind the wheel, by keeping a safe following distance and by not using your phone while you drive. It's safest to be on the road when visibility is good and when the roads are not congested. Improve your time of day score by avoiding night driving and rush hour where possible. We all know speed kills. The faster you are travelling, the less time you have to react if something unforeseen happens. Also, accidents at higher speeds are generally far worse and more likely to be fatal. Improve your speed score by sticking to the speed limit and ensuring that you're travelling at a safe speed. Information pertaining to your style of accelerating, braking and cornering is collected. We also use your location data and handset usage to capture your usual driving behaviour and routines. What are the technical requirements for SmartDrive? To participate in the SmartDrive program, you require an iPhone 5 and higher, running iOS 8.4 and higher. Alternatively, you can use an Android phone, running Android OS version 5 or higher. You will also need to ensure that your location services are activated and that the Youi app permissions are switched to 'Always'. Please note that SmartDrive is not available on Tablets. How do I activate the location services on my phone? Then look for Location Services. Scroll to the Youi app. Set allow location access to 'Always'. The amount of data you'll use will depend on the number of trips and the duration of your journey. Generally, the Youi app will use between 1 MB and 2 MB for each hour you drive. This is similar to the data usage of any navigation type app. If, for some reason the app was unable to upload your journey data whilst you were driving, the app may continue to upload this data after your journey has come to an end. How will the Youi app impact my phone's battery life? The Youi app will have about the same impact on your phone's battery life as using a navigation app. We have put in a great deal of effort to reduce the impact as far as possible. For instance, your phone will switch to economy mode after an hour of driving which should help reduce the impact. That being said, we do recommend that you travel with a car charger for your phone if you are travelling long distances. How will SmartDrive know that it's me driving in my own car? Development is underway on sophisticated data analytics to be able to assess your driving patterns and style in order to identify whether it's the registered SmartDriver who's driving or not. While this may not be 100% accurate, we are confident that in time, we'll identify trips made on a train, taxi, bus or bicycle versus those in a car. We should also in time be able to identify and exclude trips where you were a passenger. Can I participate in the SmartDrive program on multiple vehicles? Yes, you can. And, if you become eligible your SmartDrive discount will automatically apply to all the vehicles that are not used for business where you are listed as the regular driver. Other people who are regular drivers on other vehicles on your facility can also register on SmartDrive in order to qualify for premium discounts. How well do I need to drive to get the discount? By simply participating in the SmartDrive program and meeting the minimum driving criteria. The app will inform you when you have reached this goal and upon doing so you will receive the discount in the days following. What if I have an emergency and need to rush? Will that affect my scorecard? SmartDrive determines your usual driving style over a long period of time. A few long distance trips over the year shouldn't affect your overall score for driving distance and likewise a few evening dates with your partner shouldn't affect your score for daytime driving. Can my driving information be used against me at claims time? The information we're collecting will only be used to determine your eligibility for the SmartDrive Offer and will never be used against you if you need to claim. Does SmartDrive restrict how often I can drive? Not at all. The whole purpose of the app is to capture information about your usual driving behaviour and routines. Is my personal information securely kept? How do I opt out if I don't want to be part of the program anymore? The Youi app allows you to deregister from the program at any time. What are the terms and conditions for participating in the SmartDrive program?